. 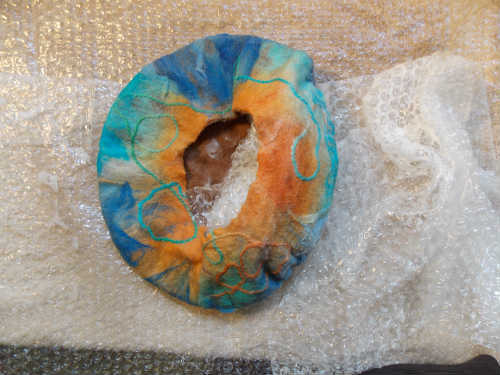 Part 5 of my Wet Felting Techniques Series. 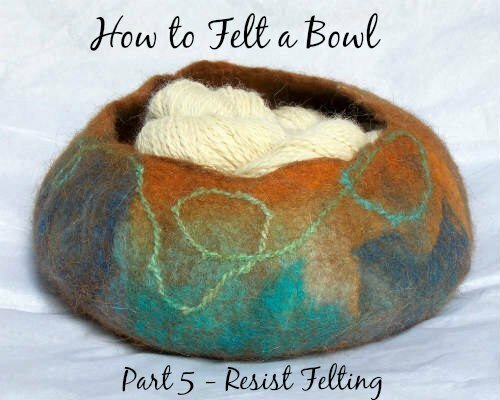 This wet felting tutorial will show you how to make a felt bowl using wool and a resist. 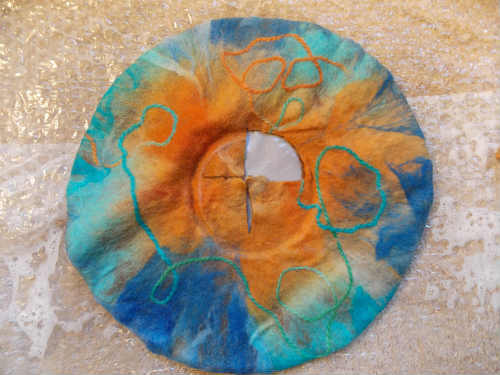 Resist Felting is a 3D (three dimensional) wet felting method that can be used to felt all kinds of things such as Christmas Stockings or Cat Pods. 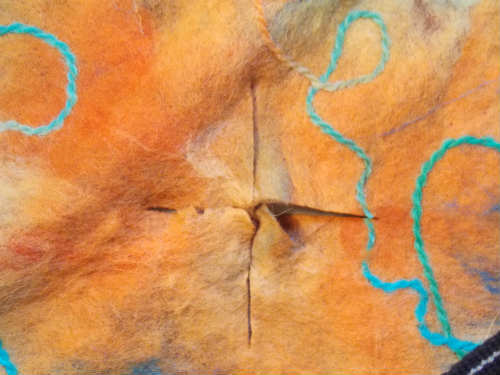 Did you see the other Felting Techniques in the Series? 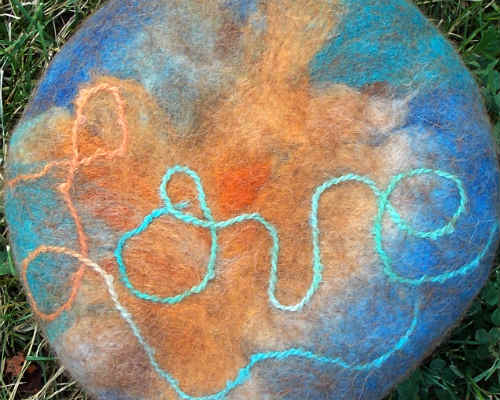 If you’re new to felting, you may want to see What is Felting? A Beginner’s Guide. That’s exactly what it means here. 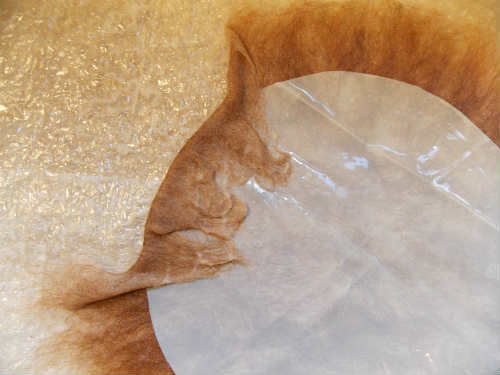 A Resist in the wet felting sense, is a barrier which keeps fibers from felting together. 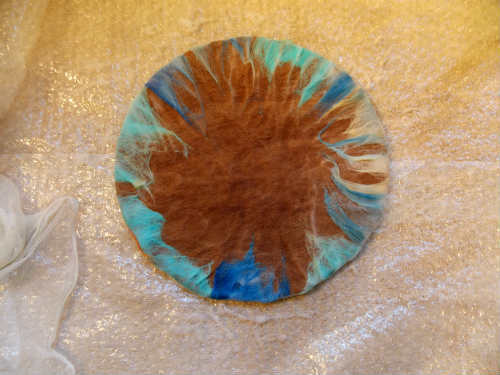 To make my wet felted bowl in this tutorial, I used heavy builder’s plastic as a resist. You could also use bubble wrap. 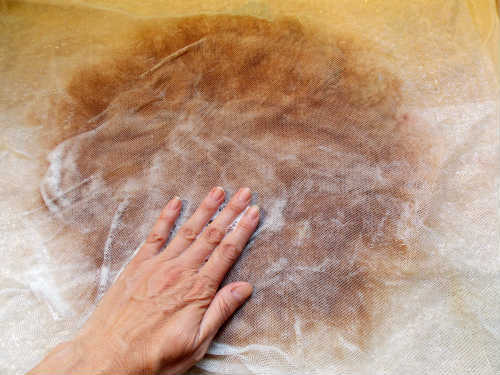 You don’t need previous wet felting experience to complete this project, however it is helpful. 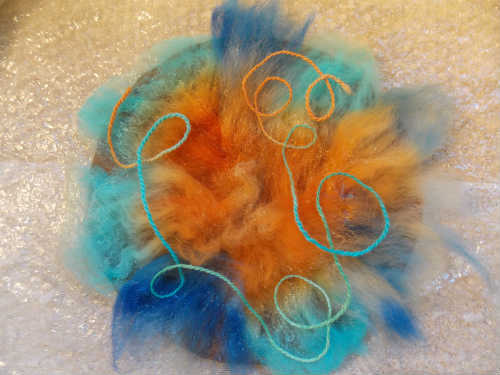 You may want to take a look at my Basic Felting Tutorial. 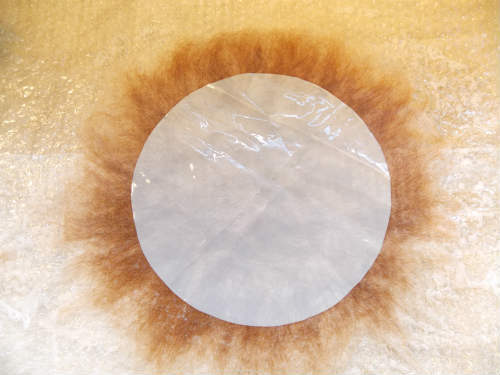 Cut your plastic resist material in a circle (mine is about 10″ in diameter). -It’s easier to begin with a larger resist, since you will have to put your hands inside the bowl to felt the inside walls. -The fiber will shrink by appr. 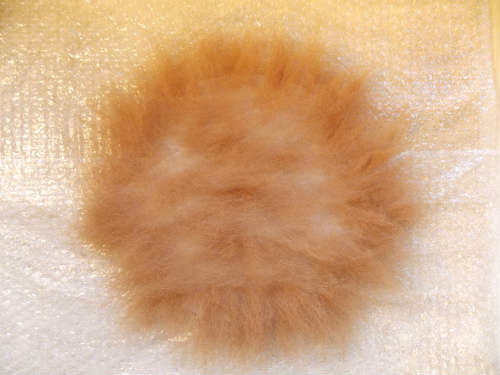 30% during the felting process. Cover the table with a large towel. 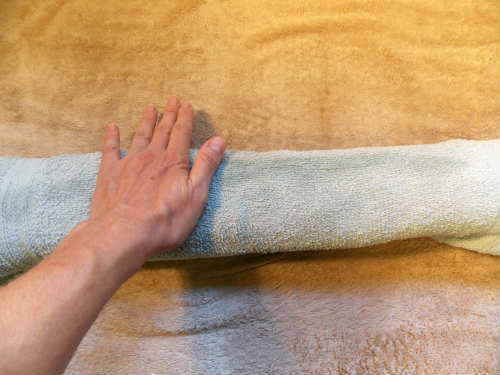 Place a layer of bubble wrap on the towel. If your bubble wrap is not larger than the Resist, use two pieces. Place the Resist on top of the bubble wrap. Take your main roving (Fawn Alpaca) in one hand and with the other hand, pull (draft) thin tufts of fiber. Place these around the edges of the Resist, overlapping slightly. 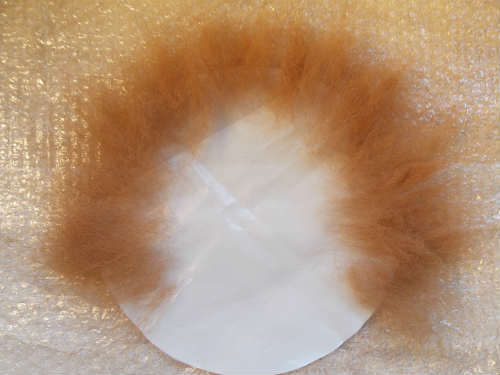 Add a thin layer of fiber to the center of the Resist, laying the fiber first horizontally and then vertically. 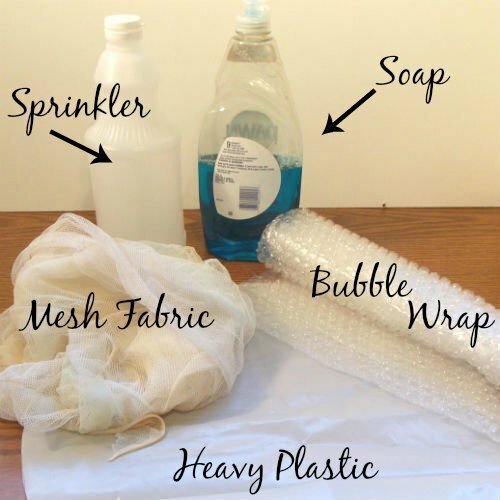 Fill the bottle with warm water and add a few squirts of the soap. Carefully lay the mesh fabric on top of the fiber and liberally sprinkle water all over the piece – don’t forget the edges. Now, place your hands flat on the mesh and begin working in the water. Just move your hands back and forth a little at first so you don’t displace the fiber. Do this just long enough to thoroughly wet the roving…. about a minute at most. Very carefully, peel back the mesh fabric. Some of the fiber may have worked its way through so gently remove it. Now, put the other bubble wrap on top of your vessel and flip the whole thing over. Next, you want to gently take the overlapping fiber and flip it to the other side of the resist … all the way around. Follow Steps 1-3, again add fiber, wet it down, work it with your hands, flip it over and fold over the edges. Yes, repeat everything 3 more times. You want at least 4 layers of the base fiber on each side of the resist. Now comes the fun part…. 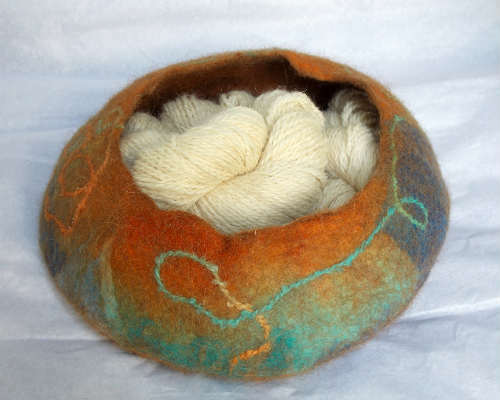 decorating your felted bowl! Decide which side will be the top and which is the bottom. This is important because you will have to cut a hole in the top of your bowl so plan your decorations accordingly. 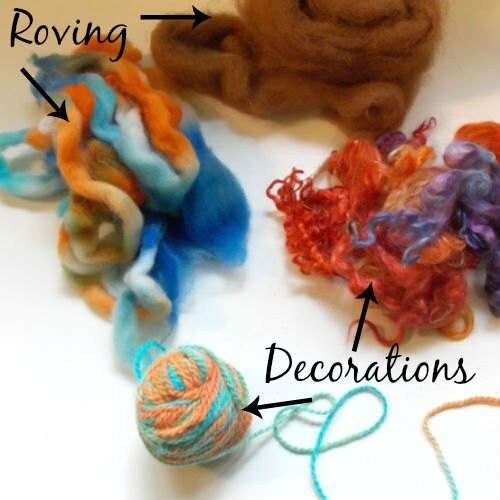 Take your dyed roving, locks or whatever and lay them out to decorate your bowl. 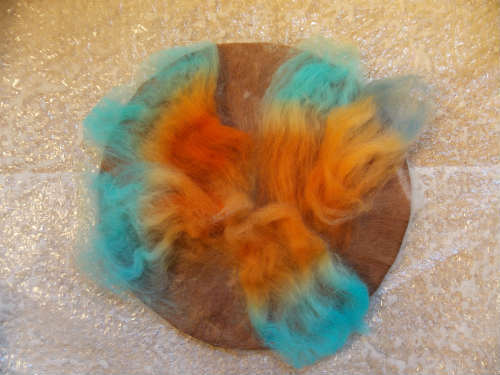 I decided not to use the dyed wool locks in the picture, opting instead for just the dyed roving and yarn. Repeat Steps 2 & 3. 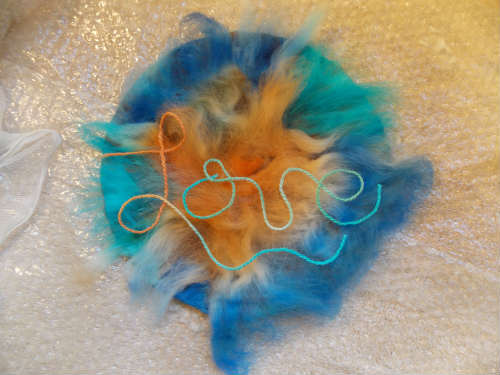 The bottom of my bowl has the same dyed roving and just for fun, I wrote the word “Love” with yarn. Now the real work begins. 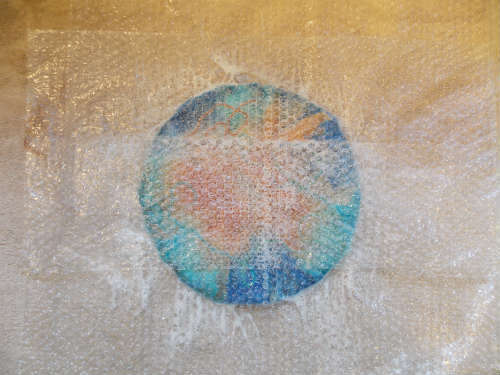 Place your bubble wrap on top of the piece and begin rubbing it with your hands. Add more soapy water, if needed. Once the top fibers are starting to hold together, you can gradually apply more pressure. Flip the piece over and work the other side. Don’t forget to work the edges, too! Work the whole piece for a good 20 – 30 minutes. Next, place your piece between the bubble wrap and roll the whole thing up tightly in another towel. It’s helpful to secure the ends with some string or scrap yarn. Now, roll the package back and forth, adding more water as needed. Check your fiber every 5 minutes or so. Is it holding together well? Is the piece hardening? Shrinking? You’ll notice the resist begin to buckle within the piece as the fibers shrink. This is the scary part! The time has come to cut the opening for your bowl. Decide where you want the opening to be. It doesn’t have to be in the center…. it also doesn’t have to be round. It’s up to you. If you want it to be round, it helps to use an inverted glass as a guide. Make sure you’re cutting into the right side! Next, you want to shape your bowl. 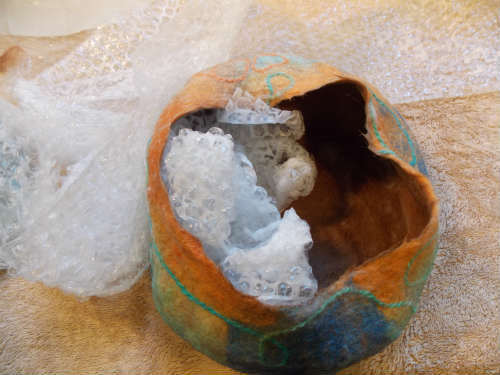 Use scrunched up bubble wrap and begin vigorously working the inside and outside of your vessel, shaping it as you go. This will harden the fiber so that your bowl doesn’t collapse. It’s hard to say how long it takes – you’ll be able to tell when the fiber is sturdy enough to hold up by itself. The longer you work the fiber, the harder it becomes and the more it shrinks. Once your bowl is the way you like it, and holding up well, you want to thoroughly rinse it to remove all of the soap. Squeeze out the excess water. Reshape your bowl and set it somewhere to dry. You are a woman of great talent and patience! Thank you for sharing both with us weekly on the Clever Chicks Blog Hop.